The Second World War may be ending, but the war on crime knows no surrender! Britt Reid, "daring young publisher," matches wits with the underworld, with spies, saboteurs, and anyone who stands in the way of a better postwar America! Here are twenty punchy, fast-moving and dynamic episodes from 1945. 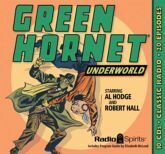 Al Hodge and Robert Hall star as The Green Hornet -- scourge of urban vice, foe of exploitation, and enemy of corruption! Digitally restored and remastered, many of these adventures have never before been available to the public. Hear them now for the first time since their original broadcast!